Many options available from conventional off-the-shelf models to specially modified high-performance valves. 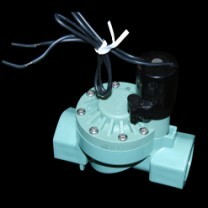 Choose electrical or pneumatic actuation of valve. Pneumatic operation is quicker releasing the air faster for a better launch. 1in FNPT Standard pipe threads in and out. (3) 9V batteries required for electrical operation. Pneumatic operation is most 'reactive' (quickest method of actuation). 125 psi maximum pressure rating. Easy to disassemble if necessary. Order with or without battery clips and electric push button. Activate electrically with 24-27v power and electric pushbutton. Requires 3 9V batteries (or similar 24-27V DC power) and an intermittent switch or button to operate. It can also be manually triggered using the solonoid lever(not recomended slowest method of activation). Or modify it your self for faster activation. These sprinkler valves have been modified to be triggered pneumatically for faster operation. A modified high performance pneumatic pushbutton is added for performance and ease of use. Just push the button on the top of the valve to activate. This is by far the simplest high performance trigger. A specialy selected high performance blow gun is connected the the sprinkler valve via quick connect fittings and 18 inches of plastic tubing. Simply queeze the lever down on the blow gun trigger to activate the sprinkler valve. Tube can be cut to locate your trigger where you need it. A hard to find paddle valve is connected the the sprinkler valve via quick connect fittings and 18 inches of plastic tubing. Simply queeze the lever down on the paddle valve trigger to activate the sprinkler valve. The valve has two holes that can be used to mount the trigger. Dual pneumatic sprinkler valves can be paralleled to one trigger. 125 psi safety pop-off valve.